So although I got a very late start to the day, it appears at least one Golden Daemon winning or aspiring painter is following my blog. I don’t really run in that circle, I’m not a bad painter, I can do better, but I paint my army or my toy soldiers to use in games. People are often surprised I don’t enter more painting competitions, I just don’t need more stress in my life. Painting 28mm miniatures can be stressful enough without flying to a contest and having them subjected to incredible scrutiny. I just try to do the best I can, on the models I need to paint to play, in the time I have available. What did I paint today upon learning that expert level miniature painters are paying attention to my little tips, techniques, and travails? I drybrushed sand! 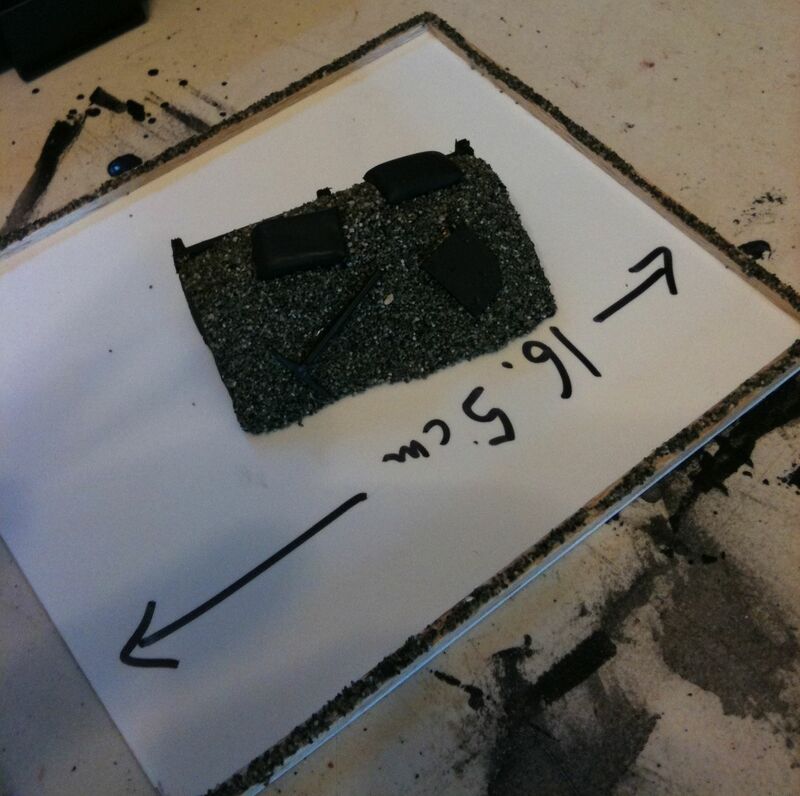 That’s right boring old beach sand, drybrushed a series of browns, that is what I needed to do to get the second movement tray finished for the Neatherworldly Mathematicians. Since I knew I had to do this anyway I got out two entrenchments that have been off on the side of my painting desk for a month or more. They needed some sand and drybrushing too. After drybrushing sand, I painted wood and drybrushed that too. 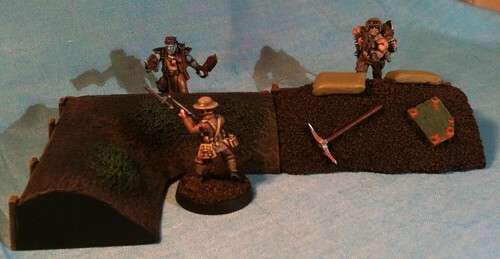 Then I painted sandbags and drybrushed them as well. I was running out of dry brushes. That is the thing about drybrushing, you really do need a dry brush. I painted the other details on my hand built entrenchment and the green growth on the Snap Dragon one and called them done. 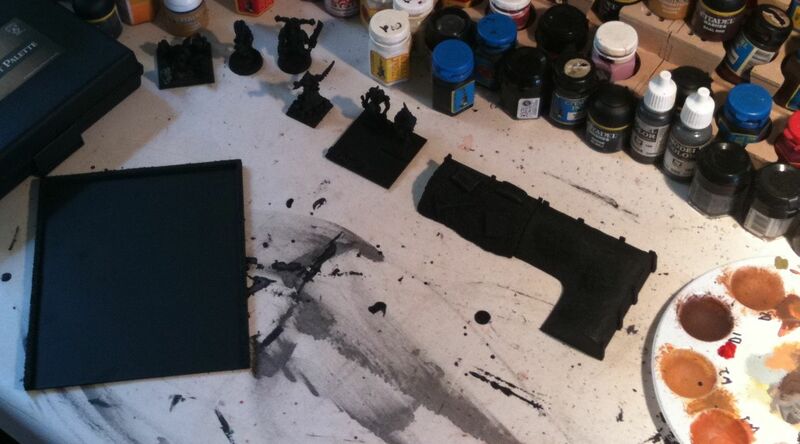 Not before I mixed up a custom rust wash and applied it to the metal plate and the pick axe. 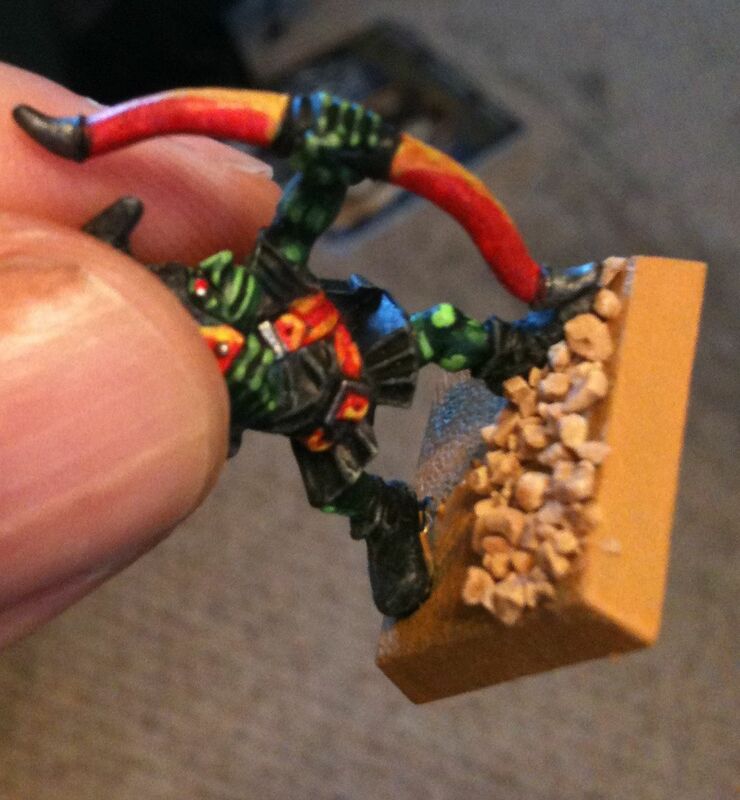 Remember my other big goal for the week, basing 54 Night Goblins? Well here is the material I bought years ago when I was considering strongly doing a Warhammer Ancients army. Amazingly I’m tired of drybrushing mud, so I decided my next army, my first new army in decades, would be based with something other than drybrushed sand. I opted for a fall scheme, now all I needed was to choose a brown. 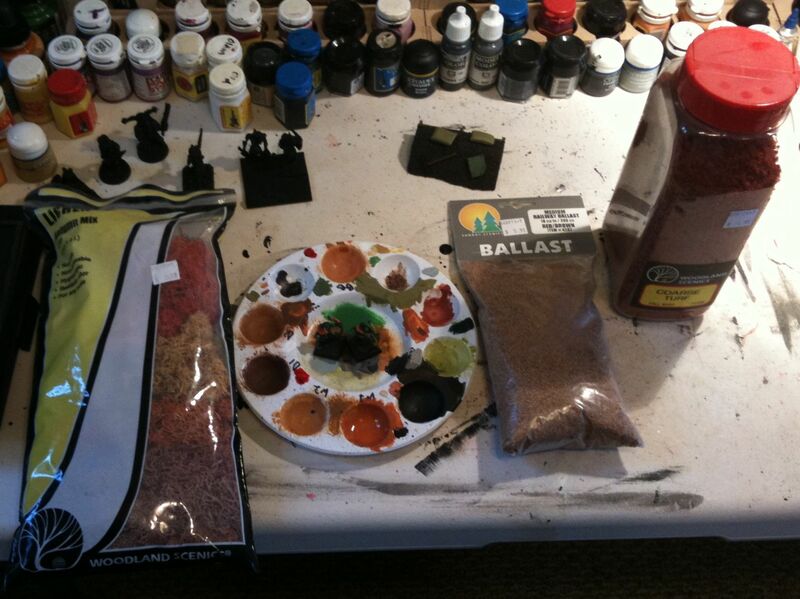 When I started the Trench Table project I went to Deserres and stocked up on browns. I picked four I liked best and upon inspecting the alsorans, I opted to use the one I labeled W2. It is an in-stock Delta Ceramcoat Golden Brown. 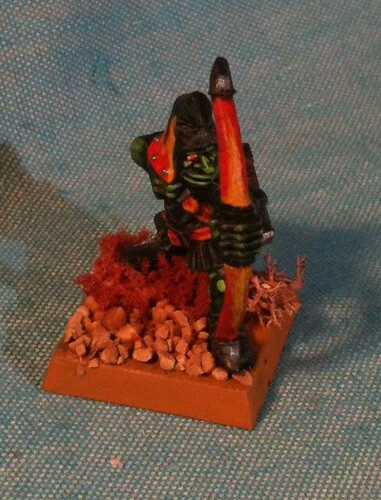 Last night while not sleeping, I remember I had two spare Night Goblin archers painted in my miniature case in colour schemes I discarded years ago when I did up some greenskins to play Mordheim. My greenskins were deemed such a success and so old school pressure was put on to paint the other 150 and have an army of them. Now about 8 years later I’m very close to having a playable Warhammer 8th Edition army of goblins. Loyal readers will know I opted to use Nurgle Daemons in the Mighty Empires campaign at Strategies as it was even less work getting them legal for 8th Edition, however in an unexpected campaign twist it is mandatory mercenaries week, so some of the Night Goblins must get based in time for Sunday’s game. 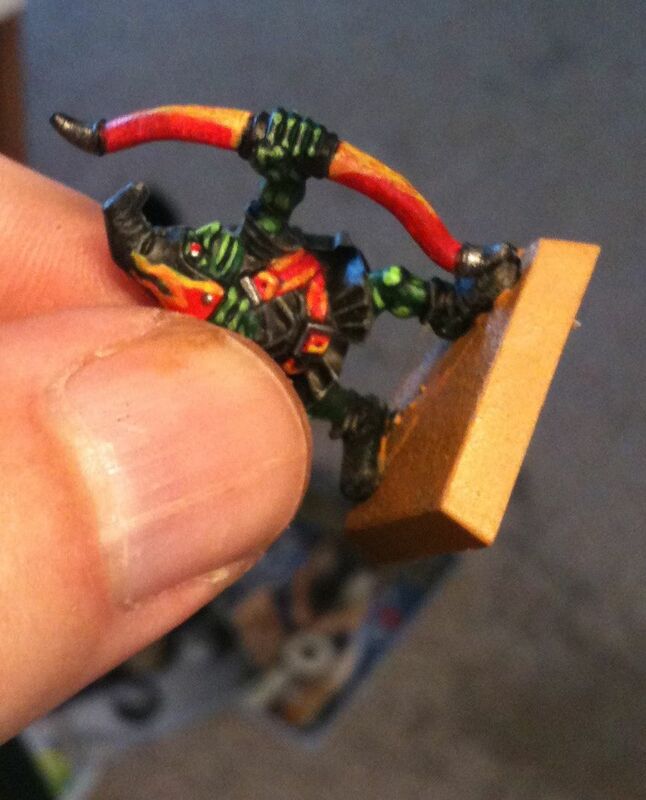 I tried the Golden Brown on the base of one of these unneeded but still painted Night Goblin archers, it looked like peanut butter. I put the ballast on, it looked like crunchy peanut butter. I’m not sure I need any more jokes about this, impatiently I put some of this weird red flock, or what I thought was flock on. It seems to be really fine foam-like material, you kinda have to squish it down with the end of a brush say to get it behave a bit more. I wasn’t crazy over how it looked or the colour, but it certainly was different. That might just make a big headache, mess. The finished model looks OK, hopefully it looks fine with my purple and blue flamed Night Goblins, the Nefarious Fire Tribe. I’ve even named all the units now. 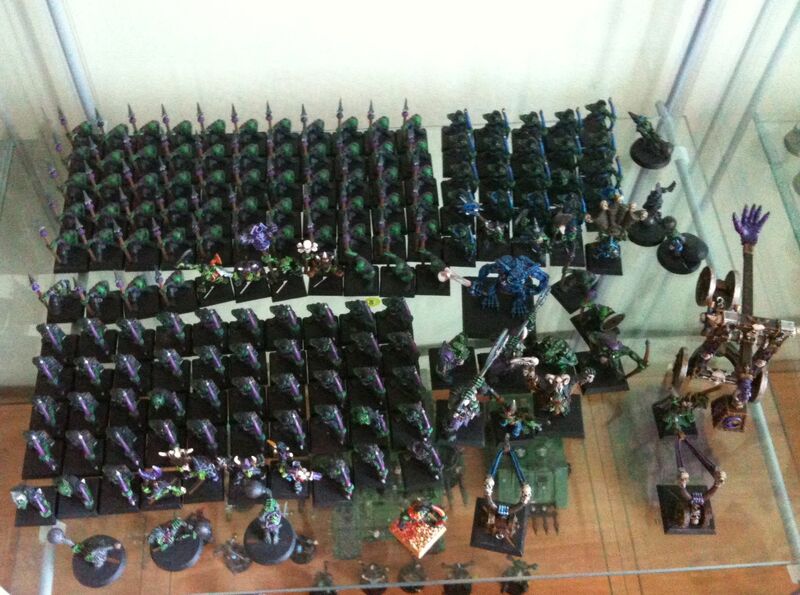 The one getting based is of course Ickybob’s Boyz still to come are the Prickly Posse and the Blue Bootie Brigade. My ork unit which isn’t assembled or painted will be called Snaggletooth’s Snappers and will be lead by Ol’ Snaggletooth himself. The Battle Standard Bearer and the Warboss who lead the other two goblin units might have had names last night while I couldn’t sleep, or perhaps they did not. 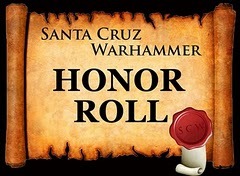 After dinner and a fresh round of applying for jobs, I’ll start work on making my custom magnetic movement tray for the 54 (55 with Hero) strong unit of Night Goblin archers, ranked up in five rows of 11.